Close to Dartmouth, the River Dart and some wonderful beaches. 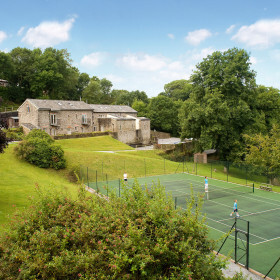 Splash inside or out in the two pools, unwind in the hot tub, win a match on the tennis court. Barcroft Manor is a hidden Devonshire gem. 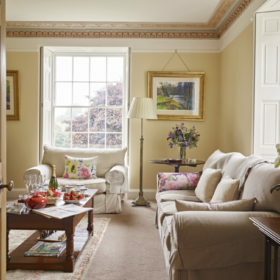 Throw open the sash windows and soak in the views. What better way to wake up each morning than with the sight of the sunrise over the South Hams. 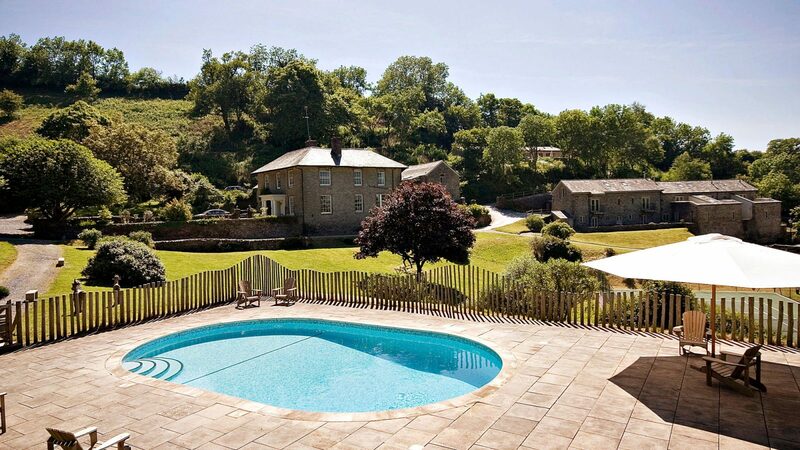 Where an area of Outstanding Natural Beauty meets the stunning coastline, in a Devonshire valley lies Barcroft Manor. A touch of the classic and a sprinkling of the luxurious blend together for a seamless mix of new and old. 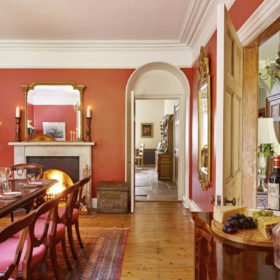 Barcroft Manor is the Georgian house where five bedrooms and a cosy snug open up a world of possibilities. From pirates attacking from the starboard side, to Prince Charming sweeping you off your feet and everything in between. 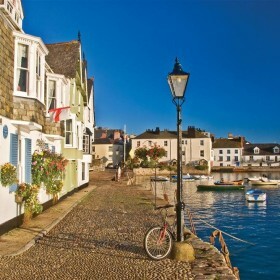 Meander down to the beautiful South Devon coast. 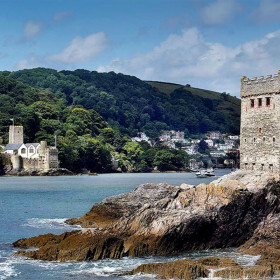 The breath-taking beaches and the chic waterside towns of Dartmouth and Salcombe are awaiting your arrival. 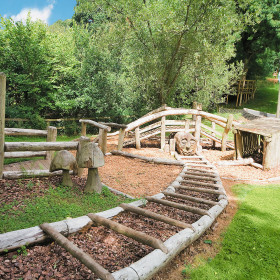 Barcroft Manor has a private garden, perfect for family afternoons out in the sun. Let the children run around on the lawn as the grown ups relax on the garden furniture with the scent of sizzling sausages in the air from the barbecue. 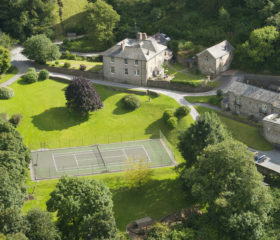 Explore the 14 acre estate surrounding Barcroft Manor. 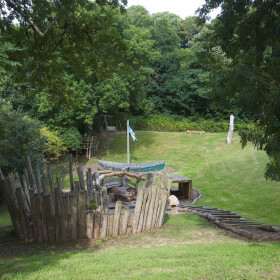 The shared estate is a sanctuary to a wealth of wildlife including deer, badgers and owls. 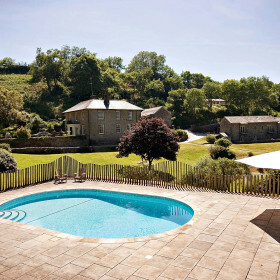 Take a dip in the shared outdoor pool, or just soak up the rays on the bathing terrace. Be sure to open your eyes now and then to catch a glimpse of the stunning views over Dartmoor National Park. 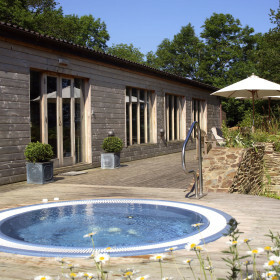 The shared spa facilities are a real treat, unwind in the sauna and steam room. 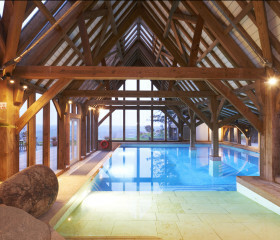 Choose from a heated indoor pool or a sunken hot tub under the stars. Simply perfection. If you’re more of the active type, why not give the tennis court a once over, and don’t worry we provide the racquets and balls. 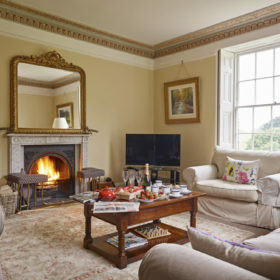 There is a large and airy living room at Barcroft Manor, perfect for getting together with family and friends to unwind and relax. Sink into the comfy sofas and enjoy the latest blockbuster on the large flat screen TV, just make sure you can reach the popcorn. 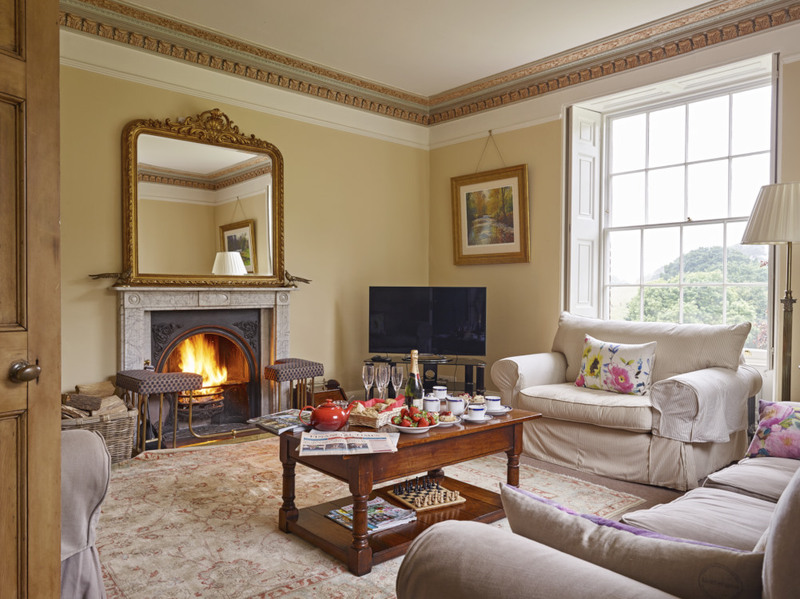 Curl up with a good book in the Snug room, which doubles as a games room. Children will love it with lots of board games to make use of and a Nintendo Wii to play on. 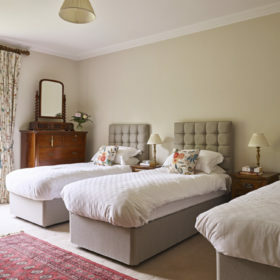 Barcroft Manor has six bedrooms sleeping up to 13 guests. 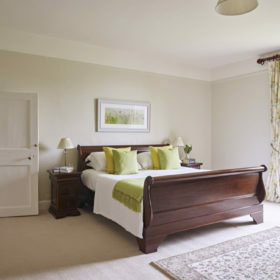 The master bedroom has an en suite, and along with the second bedroom has a super king sleigh bed. There are two further bedrooms each with zip and link double beds in them. 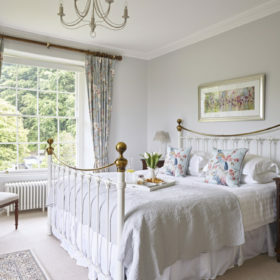 One bedroom has a white, forged iron Victorian-style king size bed. Four of the six bedrooms have plenty of space to add a cot for maximum flexibility. The final bedroom is on the ground floor and is a Twin. As well as the en suite bathroom there is also a large family bathroom on the first floor, with an impressive cast iron tub and a downstairs shower room. 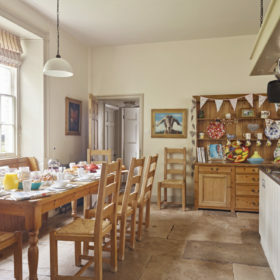 The flag-stone kitchen has a full ‘batterie de cuisine’ with plenty of space for large family groups, to sit and enjoy breakfast at the kitchen table. 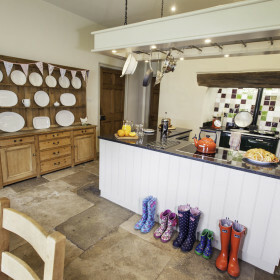 The oil-fired Aga and conventional electric oven are the perfect tools for cooking up a storm. 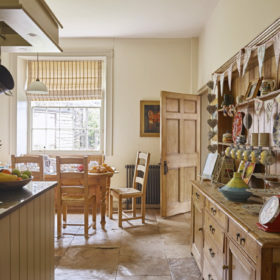 Make the most of our huge walk in pantry adjoining the kitchen at Barcroft Manor. 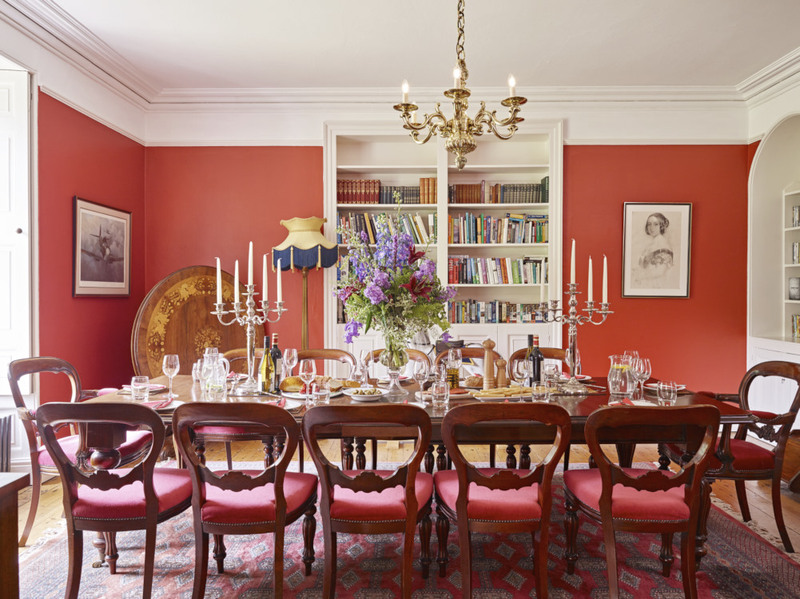 The formal dining room has elegant shutter windows, with views over the gardens, and is lit by a decadent French chandelier. 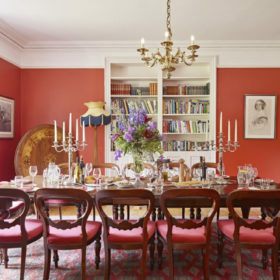 The large mahogany dining table seats up to 12 guests. 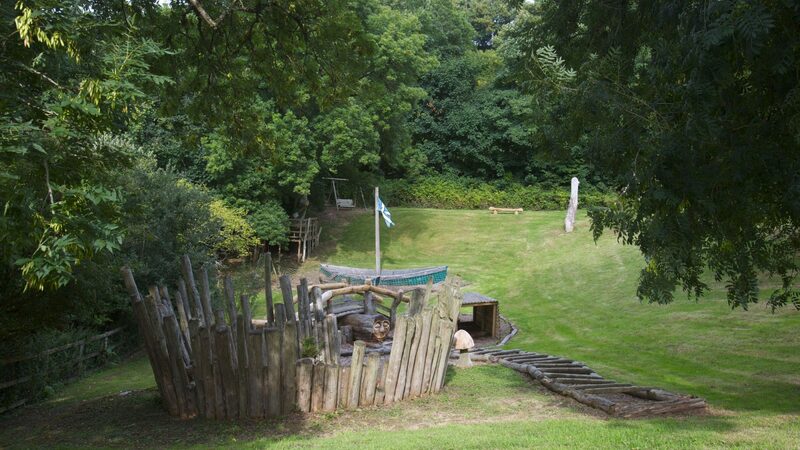 Barcroft Manor has so much to do for children of all ages. For the babies there are the cots, high chairs and safety equipment, and not to mention the babysitting service. For the toddlers there is heaps to enjoy, best of all is the soft play area with it’s colourful ball pit and the toy shed which is jam packed with games the little ones will love. The older kids are spoilt for choice. 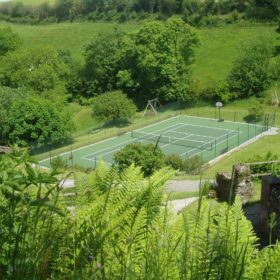 Splash around in the pool, win a game, set and match on the tennis court, play horse at the basketball hoop, or run around on the adventure playground. There’s a pool table and loads of fun stuff for children of all ages in the games room, from toddlers to teenagers. Just the place for the kids to hang out or Mums and Dads to let off steam. 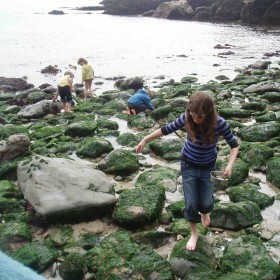 Beyond the gently rolling South Hams find sandcastles and snorkels on the Devonshire coast. 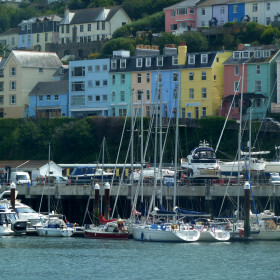 Try sailing, kayaking, fine dining or shopping in Dartmouth. Give hiking and cycling a go in Dartmoor.